In the summer we get calls about hot attics. In the winter we get calls about wet attics. Both of these problems are either caused or made worse by inadequate attic ventilation. 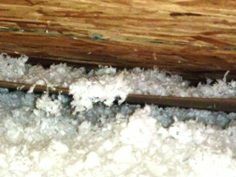 Attic ventilation problems can be caused by a number of things. A lack of intake ventilation is one of the biggest items. 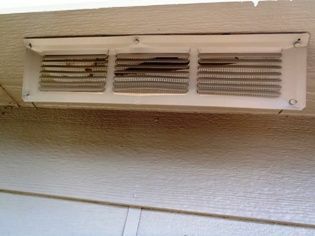 Soffit vents blocked by insulation is a common problem. 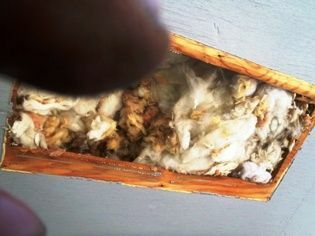 It is almost impossible to tell from the outside if the vents are blocked by insulation. 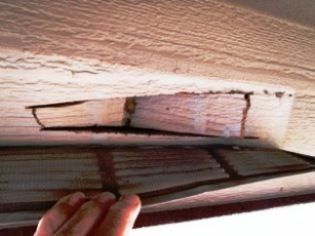 We see poorly cut soffit vents often, sometimes you can see the problem from the ground. Insulation baffles usually block the soffit vents! 8" x 16" soffit vents provide 65 square inches of net free area for intake ventilation. That much area needs to be clear all the way up to the open attic space. Hot air cannot get out unless there is cool air coming in to replace it. 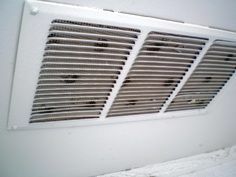 The cool air cannot get in if it is blocked by baffles or insulation. Please don’t block the soffit vents with baffles! These baffles give an air channel 3.5 inches by 22 inches which equals 77 square inches for each rafter bay. These baffles gives an air channel about 8 to 12 square inches. Not nearly enough for the 65 square inches we need. This baffle gives an air channel of about 28 square inches. These are only useful if there are baffles installed along the whole length of the eave AND the soffits are connected. This photo was taken in a new house at Anthem Ranch in Broomfield Colorado. The builder spent thousands of dollars to install the insulation baffles on this home and it was all wasted by the sloppy work of the insulation installers who blew insulation into the baffles. Unfortunately there is no way to tell from the outside that there is a problem with the installation. 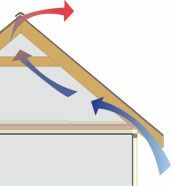 Just because you can see soffit vents does not mean there is cool air going into the attic. Sometimes they are blocked by insulation or framing. Sometimes the opening is not all cut out. This soffit vent is nearly worthless for ventilation. 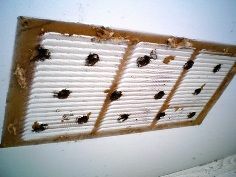 Not only are the holes very small but there is no way to tell if there is insulation blocking the vent. These holes will give about 14 square inches of ventilation instead of the 65 si there should be for an 8" soffit vent. This vent was poorly cut and they did not even take out the piece. Looking through the louvers you can see there is a very small hole cut for this soffit vent. The hole was not even cut out for this vent. The soffit vent was just nailed in place and painted. No air is going through this vent, stuffed with fiberglass. 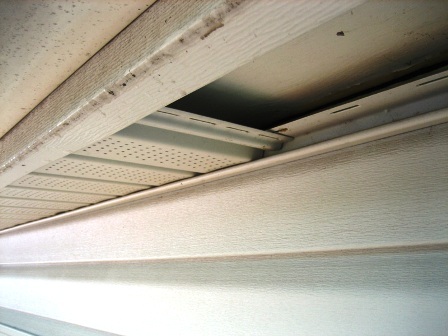 When new vinyl or aluminum soffits are installed on a home that already has siding, they always cover up the soffit vents. 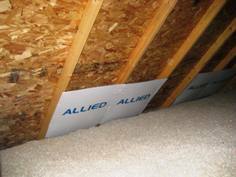 Sometimes they install ventilated soffit sections but they are only effective if the installers cut the existing soffit material away and move the insulation out of the way so the air can go up into the attic. 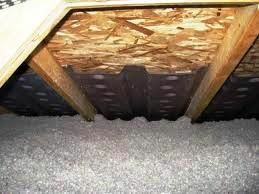 These ventilated soffit sections are only rated at 5 square inches of net free area per square foot so the only way they will work is if the entire home has ventilated soffits AND all of the soffits have airflow up into the attic. As you can see, these ventilated sections will not let any air up into the attic. The soffit boards are still there. Garage ventilation can be problematic. While we want to ventilate the garages in the summer to prolong the life of the shingles and to make it more comfortable, we want to keep it warm in the winter. Also, garages have different designs. Some garages are unfinished and others are completely finished. Often the drywall in the garage is a firewall and care must be taken with penetrations. Roof vents are needed to let out the hot air. Either convection or powered vents can be used. To seal them in the winter, closeable dampers can be installed. 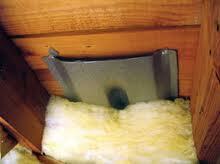 If it is not hard to get to the vents, they can be sealed with plastic sheeting or fiberglass batt insulation. 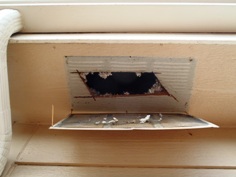 Unless you have a very tight sealing door, soffit vents are probably not needed. If you have a tight sealing door you may be able to leave the door slightly open to provide intake air. If this is not an option, we sometimes install automatic vents that close when it is cold. Both rooftop exhaust and soffit intake vents are needed if the garage ceiling is finished with drywall. This will keep the attic temperature lower. If the garage faces west or south it may get really hot and need active ventilation in the garage itself. Exhaust fans can be installed in the garage wall or ceiling to exhaust the hot air from the garage itself. The Quiet Cool GA ES-1500 garage exhaust fan can be installed in the ceiling of the garage and has a fire resistant damper. Note: Radon Mitigation is a separate field outside of the scope of our work. In the old days, crawlspaces were ventilated. The idea was that air moving through the crawlspace would keep it dry. Sometimes fans on humidistats were installed to really move the air. Problems arose in the winter because pipes would freeze, not to mention cold floors and high heat bills. In the summer, when the warm moist air contacts the cool crawlspace, the moisture condenses out of the air like on a glass of iced tea. Instead of drying out the crawlspace it gets more moisture. 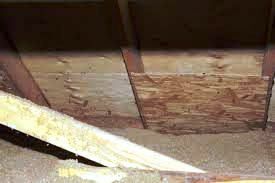 Now, building professionals have decided that the crawlspace is considered to be INSIDE the house. It is called a conditioned crawlspace. We want the crawlspace to be the same temperature and humidity as the rest of the home. If moisture is a problem, keep the water from coming in. Make sure the downspouts have extensions. If there is a high water table, install a sump pump. 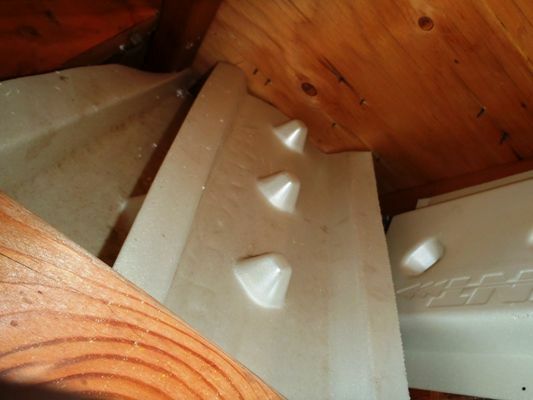 Insulate the crawlspace walls, not the underside of the floor. Put a heavy liner on the crawlspace floor and wrap it up the walls. We used to do crawlspace ventilation but we spent most of our time telling people they do not need crawlspace ventilation. 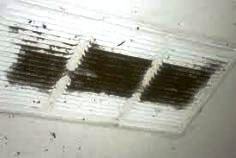 Except in rare cases, Vent Masters Inc. no longer does crawlspace ventilation.